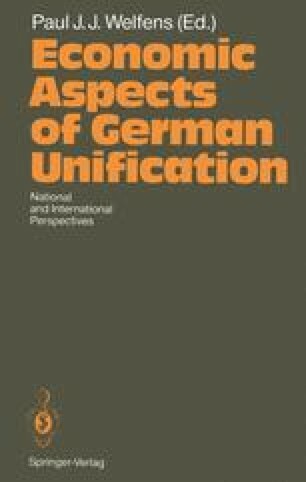 The economic and political unification of Germany in 1990 came unexpectedly. The economic and political collapse of the German Democratic Republic occured after 40 years of a socialist regime which enjoyed only transitory stability and never achieved the proclaimed goal of catching up with West Germany. A unique economic and political challenge emerged for Germany and the Western world when the political division of Germany ended in 1990. What had begun with several hundred people from the GDR seeking asylum in West German embassies in Budapest, Prague and Warsaw quickly became a starting point for a wave of westward migration of East Germans in 1989/90. Starting with the “leak” in the East Germans’ favorite tourist country, Hungary (allowing East Germans to cross the border to Austria), the summer of political discontent in the GDR rapidly led to the collapse of the Berlin Wall in November 1989 and, a year later, to the political unification of Germany. I am immensely indebted to Tim Yarling for his editing talents and for all his other superb assistance.